I am over the moon excited about two things... first up is Bitty Blocks. Have you been following along with Quilty Pleasures Blog and their Bitty Blocks? I've been following along but hadn't made any yet. I kept thinking I was going to and just haven't taken the time. Well, today I received an email from Diane at Quiltmaker and she has ask me to design a Bitty Block for the upcoming Quiltmaker's 100 Blocks Blog Tour (which I'm a part of). I'm so excited. I think I know exactly what I'm going to design but you'll have to come back November 16-20th. If you haven't been following along with the Bitty Blocks, you can find all of them so far here. 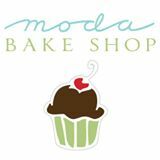 The second thing I'm over the moon excited about is.... Moda Bake Shop has accepted my pattern "Nines in the Middle" and is sending me fabric to make the quilt. Whoo Hoo!! I'll keep you posted on that as well. Right now I have no idea when it will be featured. Congratulations on both accomplishments! Looking forward! Holy cow! How wonderful. Congratulations on both. Can't wait to see the Bitty block you come up with. I have collected all the patterns so far. Funny that you posted this because I just pulled out my Bitty Blocks to see how far behind I am. Congrats on being asked to make a block! Can't wait to see what you come up with.